Aspen prepared an EIR for the CPUC for the replacement of the steam generators for San Onofre Nuclear Generating Station (SONGS) Units 2 and 3. The original steam generators needed to be replaced because they were being degraded from stress and corrosion cracking, and other maintenance difficulties. Replacement was necessary to allow the continued operation of the plant through the end of the current NRC license period for each unit. SONGS is located on the Pacific coast in north San Diego County, California, within the boundaries of Marine Corps Base Camp Pendleton. 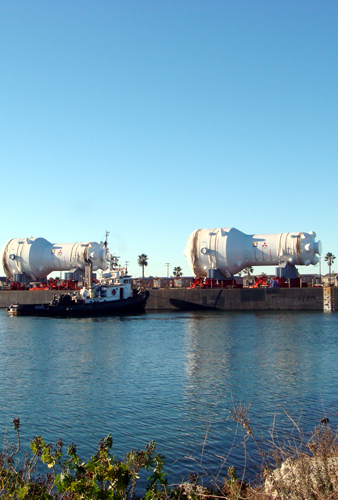 The replacement steam generators were to be barged from Camp Pendleton’s Del Mar Boat Basin and then transported 15 miles overland to SONGS using prime movers. Replacement of the steam generators was scheduled during refueling outages for each unit. The original steam generators were to be transported by rail to a licensed low-level radioactive waste disposal facility for long-term storage. The EIR analyzed the impacts of four components of the proposed project: (1) transport of the replacement steam generators to SONGS; (2) staging and preparation of the replacement steam generators; (3) removal and disposal of the original steam generators; and (4) installation of the replacement steam generators. On behalf of the CPUC, Aspen also arranged and conducted scoping meetings and Draft EIR public workshops for the proposed project.